Ambassador Haley criticizes upcoming vote at UN against U.S. recognition of Jerusalem as Israel's capital. Nikki Haley, the U.S. Ambassador to the UN, on Tuesday referenced the upcoming vote at the UN General Assembly on a resolution protesting U.S. President Donald Trump’s recognition of Jerusalem. “At the UN we're always asked to do more and give more. So, when we make a decision, at the will of the American people, about where to locate OUR embassy, we don't expect those we've helped to target us. On Thursday there'll be a vote criticizing our choice. The U.S. will be taking names,” she tweeted. The vote at the UN General Assembly on Thursday was initiated by Turkey and Yemen, and comes after the U.S. delegation to the UN on Monday used its veto power to shoot down a similar Security Council measure rejecting Jerusalem as Israel’s capital. The Palestinian Authority (PA), angered by Trump’s recognition of Jerusalem, attempted to negate the recognition at the Security Council, but since that move has failed, will try to pass a similar resolution at the General Assembly, where the U.S. has no veto power. The Israeli Foreign Ministry has been trying to persuade various countries not to participate in or to oppose the vote on the resolution, though officials in Jerusalem acknowledged on Tuesday that the resolution is more than likely to be approved. Haley, who is a strong supporter of Israel, spoke on Monday ahead of the vote on the Security Council resolution, and made clear that the United States will not "make the same mistake again" by allowing one-sided resolutions against Israel to pass by refusing to use its veto power. 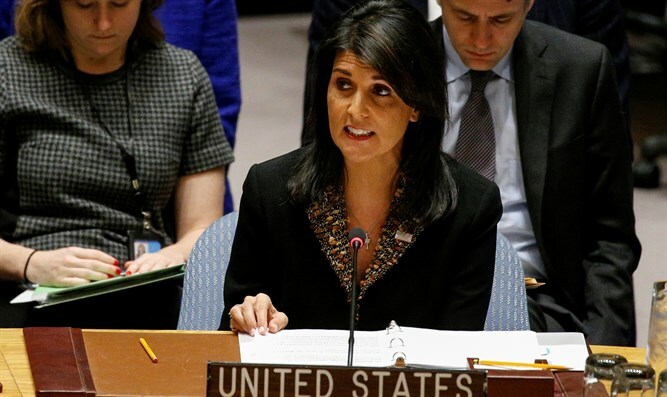 Haley criticized the Obama Administration for allowing the passage in December 2016 of UN Security Council Resolution 2334, which declared that Israel has no rights to any part of eastern Jerusalem, including the Western Wall. "In December 2016, the U.S. elected to abstain. Now it is a new administration. Given the chance to vote again we would exercise a veto power. The U.S. will not make that mistake again," she stressed.